Hello, I'm new to pixel art and creating this thread as tracking log. This is not an art dump, I simply don't want to spam the forums with every little piece I do on a daily basis, because my pieces will be smaller in size. All C&C's are welcome, but please take me easy as I'm (soon to be very obvious) just beginning with PA , I will take any help I can get, and be extremely grateful for it, hopefully you'll welcome me without any kicks or punches . I'm pretty sure most of this isn't that good. I think I could really use some guidance in improving. First of all welcome to Pixelation now sit back and relax, it's going to take a little time. Let's take a look at your portrait for a second. The proportions are alright, the shading follows a up-right corner lightsource, there are few colors with good contrast, so why is it "terrible" (it's not so terrible though, it's got potential)? As you see, I didn't change an enormous amount of stuff, yet it feels "more right". Your color palette was very linear: light orange, getting progressively darker into brown. To make your colors more appealing, try using hue-shifting: say your middle-color here is brown. Try progressing towards another color value as you go darker and as you go lighter (ex. : ). Here the darker shades go toward purple, whereas the lighter ones go toward a yellowish pink (and I lightened the skin tones bc she looked a bit Donald Trump-ish with all that bright orange ). It's not simple in the beginning (took me a year to kind of understand that :') ), but experiment until you're comfortable with hue-shifting, it's well worth it. Also, keep this in mind for now: desaturate as you go lighter and saturate as you go darker. You're very dependent on lines: coming from traditional media, you think "Oh, I have to represent her nose/collar bone/eye/eyebrow/[thing]! Easy, I'll just draw it". While when drawing with a pen on paper it works wonderfully, in pixel art, not so much. Most of the time, in pixel art, don't represent a volume with lines, but instead by using light. A nose isn't a line, it's just more of a face; it stands out because it's in 3D, and light hits it differently from the rest of the face. so it's got a highlight, it casts a shadow. Lines don't make volume, light does. You have to learn to "think in 3D", thinking "how does my lightsource affect this element I'm trying to depict?". I don't know if it's clear enough, don't hesitate to tell me if it isn't. Some of your outlines are "jagged", they don't form a harmonious curve and the result is unappealing: See this video for a more in depth explanation! About your last trial with the cluster approach, I'm really not an expert of the cluster thing so I'm not going to comment on that; I just want to say something about the palette you put on the left of your image. You put four linear ramps w/ 6 shades each, but only used few of those colors. My suggestion (I could be wrong tho) would be not to "build" your palette beforehand, but to build it "organically", adding a color when you need it. That way, you'll avoid unnecessary colors (by asking yourself "do I really need to add this color or could I use a very similar one that's already there? "), and you can make multiple "links" between the ramps. It's difficult to explain, but your palette shouldn't look like several disconnected independent ramps, it should look like interconnected and interdependent ramps: it will add visual coherence and appeal to your image, tying it together. For more information on this very important point (I insist, it's fundamental in understanding color, it took me way too long to get better because I was reluctant to learning this), go and read this whole PixelJoint topic, which helped me immensely. It's a lot to take in at once, but I promise it'll get easier as you progress! That's about it, I hope I was of some help! Hi Zanorin ! thanks for the welcome definitely taking my time to improve. The changes you've done to the face I've made are mind-blowing, although extremely small ! I'm surprised at the power you have with just a few minor changes . Thanks for the advices ! I'll look over them a few times while doing art to get them clearer in my mind. I might still do the same mistakes, but I'll definitely try to improve on it, thank you ! - Is hue-shifting restricted to neighbor colors or can I jump to other hues not connected to actual color ? I'll have to revisit the tutorials you gave me, quite a bit, until I place these deeper . I'm having some issues, onto how should I build or connect colors on the ramp. I second that question and level of understanding with Ninja. I'd also like to know other's methods of shifting hues. I choose the colours manually, and sometimes tweak later once all the colours are in. I use the HSV sliders to tweak my colours, this makes it easier since they basically encode the three important relationships between colours. "I need it bluer, a little less saturated, and darker" - each slider maps to one of those requirements. I pick "black" (darkest colour in my piece, for the darkest shadows, or for outlines) that has the hue of my ambient shadow colour and a "white" (for the brightest highlights) that have the hues of my ambient light and my main light source, and use these as a guide for picking the hues of the other colours. When picking the base colours (the ones "unaffected" by the light sources), I often mix in a little bit of the ambient hue (or a third unifying hue that contrasts nicely with the lights) into all of them to help unify the palette. This is also done manually, I just shift the sliders a little in the direction of the hue after picking the base colour. Make sure you never work on a white background (unless, of course, your work is meant to only ever be viewed on a white background). If you're adding those later after the piece is done, that's fine, though not ideal for critique. Working on a white background messes up your sense of values, it's better to work on a mid-grey so you can more accurate gauge the values in your work. You can also tint that grey with your ambient hue(s) to get a bit of a feel for how your colours should go. Are your big colour blocks for animation, or do you do those for still pieces too? 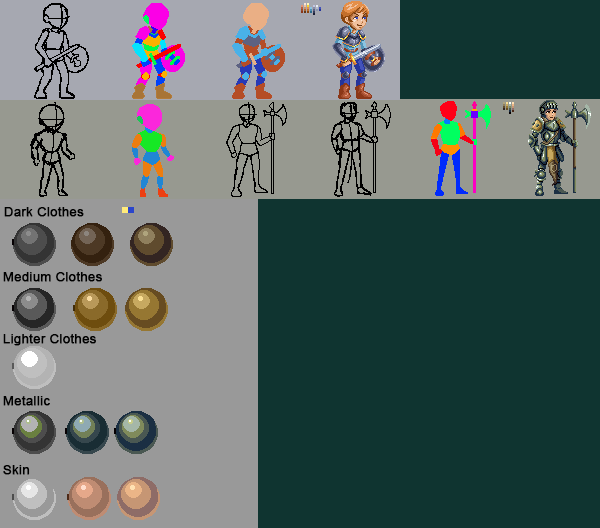 I personally only found those useful for animation (and even then, I try to keep their colours similar those from the final work and avoid using random hues), as the very distinct colours make it easy to look past posing and compositional issues that may make the final pose hard to read.